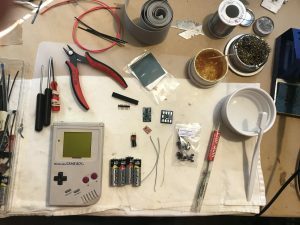 Backlight, Solder, ChipQuik, Flux, Solder Braid, Isopropyl Alcohol (70-90%), a sharp razor blade, toothbrush, q-tips, paper towels, Tri-wing screwdriver, phillip’s head screwdriver, flush trimmers, heat shrink tubing, gloves. 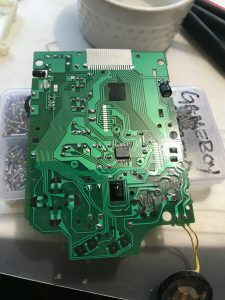 Bivert, backlight controller, capacitor kit, diode/transistor kit, auxiliary 5v Buck/Boost Regulator, celebratory whiskey and any other mods that you’d like. 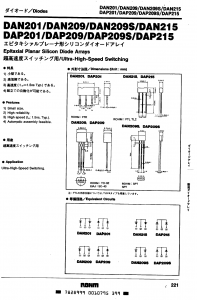 Remove the six case screws, earlier DMGs use Phillips Head screws, newer DMGs use Tri-Wing security screws. 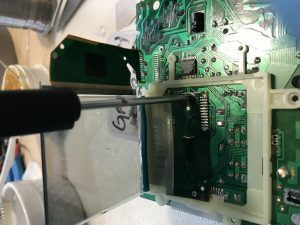 Pinch the ribbon cable connecting the LCD Board to the Motherboard with care and gently disconnect. 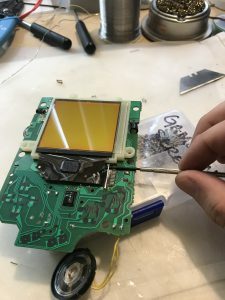 We’ll need to unscrew the LCD Board from the front half of the shell, remove the 10 Phillips Head screws, place the LCD Board on something that can support the LCD Board without putting any pressure on the ribbon cable. 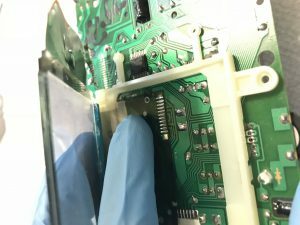 You’ll find two small Phillips Head screws and a staple that holds the Vertical ribbon cable to the LCD Board. On the backside of a board bend the two legs of the staple upward, flip the LCD Board and remove the two screws. Pry the staple up a little. Ok, we’re ready to attack the screen. 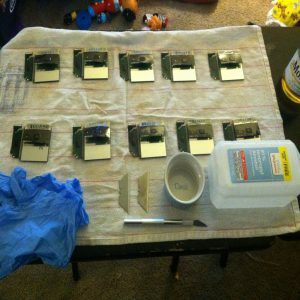 First let’s talk about Chip Quik; I use leaded Chip Quik SMD removal, which is a low melting temp solder. It melts around 180c – 200c (great for sensitive chips/components) and stays molten for around 8 seconds allowing you to remove up to 40 surface mount pins easily with a standard iron. 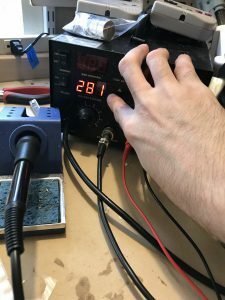 It is a great de-soldering tool, however it is NOT good for soldering. 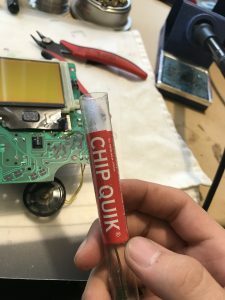 After using Chip Quik it is extremely important to remove all Chip Quik before resoldering the screen, or component, chip quik is very brittle and has a low melting point, this will cause cold solder joints, we will go over how to approach removing this later on in the tutorial. 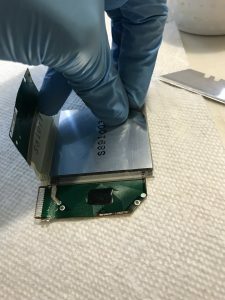 Before doing anything, dip a Q-Tip in your Isopropyl Alcohol and clean the pins of the vertical ribbon cable (move the Q-tip, gently, in the same direction as the pins), this is to remove any contaminants on the old solder joints. Once they’re nice and clean go ahead and flux the pins. 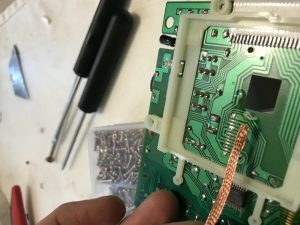 The more familiar you are working with Chip Quik, the less you’ll need to use, I use around 1/4 – 1/3 of the length of the pins (to be de-soldered), but more is fine. I personally use a “knife” tip on my iron, which I use because the point can be used for fine work, while the bevel can be used for multiple pin work. Place the piece of Chip Quik on the fluxed pins, the Chip Quik will stick to the flux. 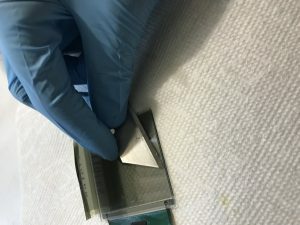 Hold your iron so that the bevel of the tip is parallel to the board and oriented perpendicular to the pin direction, gently place the bevel on the Chip Quik, melting it but don’t allow your iron tip to actually touch the pins. The pins are EXTREMELY delicate and will break if you apply any pressure to them. 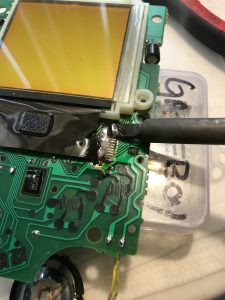 Rock the Chip Quik solder blob back and forth along the pins while, gently, holding a small flat head screwdriver, or similar on hand tool, underneath the vertical ribbon cable. 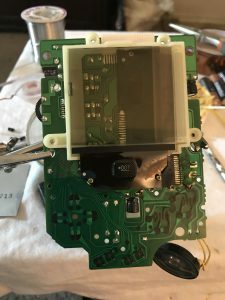 You’re not forcing anything, but when the Chip Quik has completely mixed with all of the solder joints the vertical ribbon cable will naturally lift away from the LCD Board. 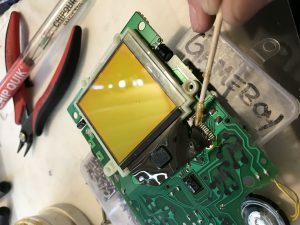 Now we’ll, gently, pry the screen up with a small flathead at the top of the screen (you’ll see a small section of the plastic frame that accommodates the flathead). 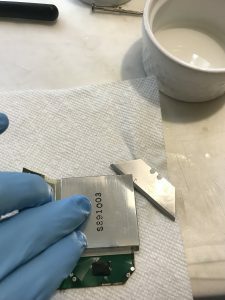 Open the screen like a book, supporting the horizontal ribbon cable, and remove the two double sided adhesive foam pieces. Remove the small black phillips head screw that mounts the horizontal ribbon cable. 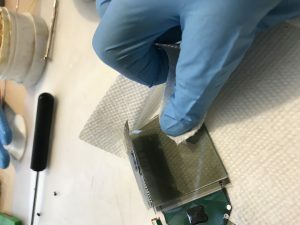 Repeat the steps we took earlier to de-solder the vertical ribbon cable, in order to remove the horizontal cable, the main difference this time around is that you need to support the horizontal cable while working, without putting any pressure on it. 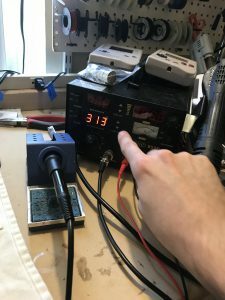 Set your iron back up to temperature, I usually stay between 315c – 340c, but this will depend on the solder you’re using, basically you want your iron to be just hot enough to easily melt your solder. 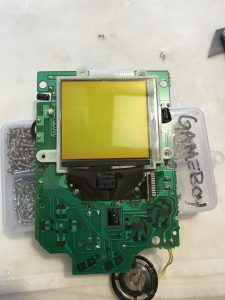 Pinch the three clips of the plastic LCD frame on the back of the LCD Board and pop the frame off. 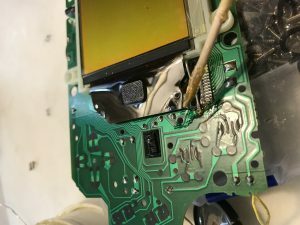 Now we need to thoroughly remove any and all Chipquik, both on the LCD Board and on the LCD’s ribbon cables. 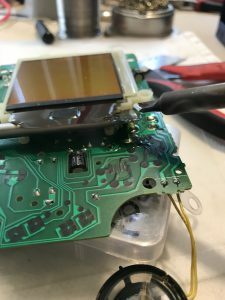 Flux the pins on the LCD Board and use your Solder Braid to wick away the Chip Quik. 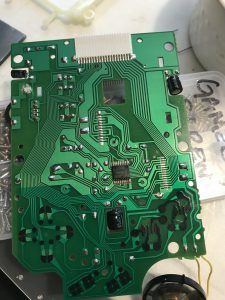 There will still be a layer of Chip Quik on the pads, so we will re-tin the solder pads with standard solder, and again flux and wick away as much solder as possible. 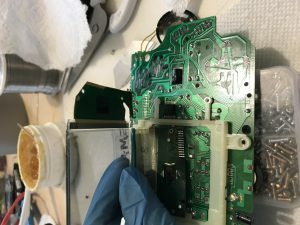 What we’re doing here is mixing any remaining Chip Quik left on the pads with standard solder, then wicking it away to remove as much of the Chip Quik as possible, rinse and repeat this process one or two times allowing us to completely remove the Chip Quik which, from here on out, should be considered as a contaminate. 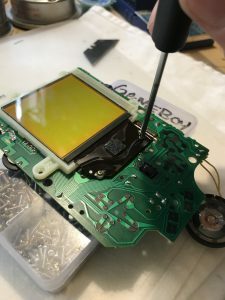 We’ll do essentially the same process to the pins on the LCD ribbon cables EXCEPT that the pins on the ribbon cables are extremely delicate and you shouldn’t use your Solder Braid on them or you run the risk of ripping the pins clean off of the ribbon cable. 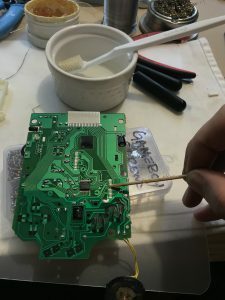 Instead, clean your soldering iron tip and place the bevel of the tip on the pins and gently “brush” away in the direction of the pins (be aware of solder splatter). 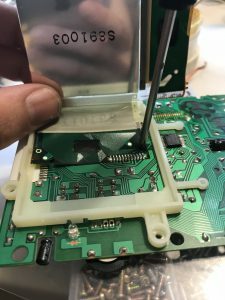 The clean tip will wick away the chip quik, clean your tip again, re-tin the pins with standard solder, use your tip to wick away the solder, clean your tip and repeat this process 2-3 times on both the vertical and horizontal ribbon cables. 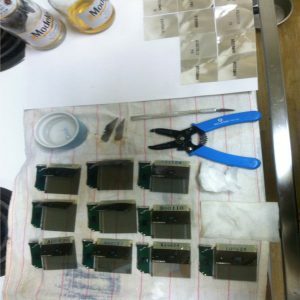 This is the perfect time to replace C4 (47p Ceramic), C6, C7, C8, C9 & C10 (1uf 50v Electrolytics) as well as test DA1, DA2, DA3 & DA4 (DAN215 Diodes) and Q1 (2SA933 PNP Transistor) and replace if need be. You may be wondering at this point how you would go about testing these 3 pin diodes, or a PNP transistor, or if you really need too. 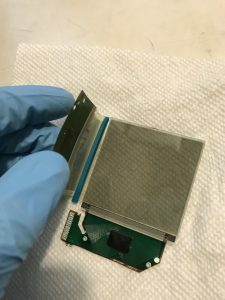 Well, yes, you do, we came here to do the job right and went through all the effort to remove the screen and this is the best access to these components that we will have. 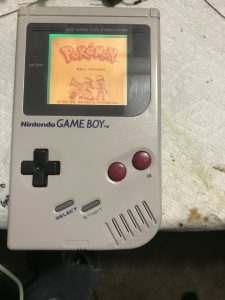 Go ahead and change all of the Electrolytic caps with Nichicon or Panasonic caps, they’re 30 years old. There’s plenty of info out there on doing cap changes, so I’ll skip that for now. Let’s test those DAN215 Diodes! This Diode array is responsible for button presses and it is imperative that they are working correctly. The DAN215 Datasheet shows us that Pin 2 (the middle pin on the Diode) is a common negative, Pin 1 and Pin 3 each have a diode between them & the common ground. 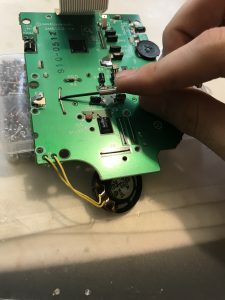 Good practice is to remove components and test them out of circuit, in this case because the LCD Board is not connected to the motherboard, and no buttons are being pressed, these diodes are not connected to any other components and can be tested without removing them. Set your multimeter to Diode function, find DA1, place your negative test lead on the common ground (pin 2) and put the positive test lead on Pin 1, you should get a voltage drop of 700 – 725 millivolts if it’s good, if you get a reading of 1 it implies an open diode (just double check your leads are hooked up correctly), if you hear a beep then you have continuity, implying a short. Do the same for Pin 3. Rinse and repeat for DA2, DA3 and DA4 replacing them as needed. 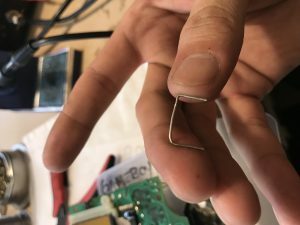 Find Q1 and remove it from the circuit. 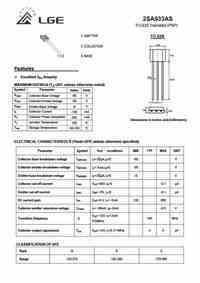 Collector to Emitter – Positive on Collector, Negative on Emitter. You should see an Over Limit reading or something similar. Now reverse the test leads, Negative on Collector, Positive on Emitter. You should also see an Over Limit reading or something similar. Replace Q1 if necessary. 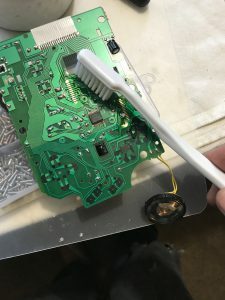 After replacing any needed components, thoroughly clean the LCD Board with Isopropyl and a toothbrush, be sure to keep the brush clean, and follow up with paper towels or q-tips before the isopropyl evaporates (as it’ll leave sticky flux residue behind). Ok, now the part you actually wanted to do, the backlighting! 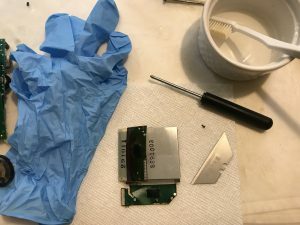 From here on it out I’ll be wearing gloves to prevent getting fingerprints on the screen, get your sharp razor blade and isopropyl alcohol ready. 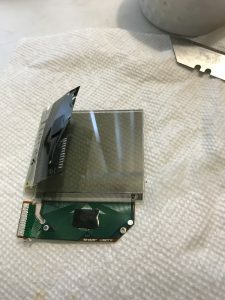 Dip the razor in Isopropyl and slide it between the LCD and the reflective film, starting at the corner, with the bevel of the blade flat against the LCD. Get the blade in about a 1/3 of an inch or until you can pinch the lifted corner of the reflective film. 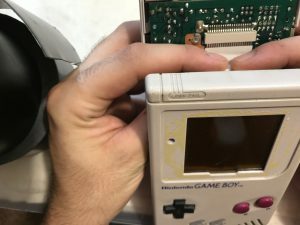 pinch the reflective film and pull it in one smooth motion, the quicker and the smoother the film is pulled, the cleaner the screen will be, but fear not if there’s adhesive left on the LCD, just dip your blade in Isopropyl and gently remove the adhesive. Follow up with a paper towel dipped in Isopropyl, and then a dry paper towel, and a can of air spray. This would be the time to address any Horizontal Lines, which I have covered in a youtube video tutorial https://www.youtube.com/watch?v=WH9LpYsBUB0&t=0s. 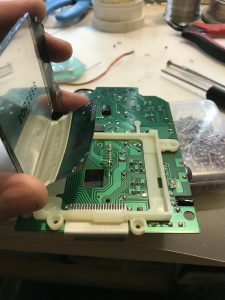 Pop the LCD frame back onto the LCD Board and Flux the solder pads. Place the horizontal cable roughly in the right place, and screw the Horizontal set screw partially in, but not all the way. Tack the pins in with your iron, using the bevel of the iron tip. Screw the set screw in all the way, and reflow the solder on the pins. 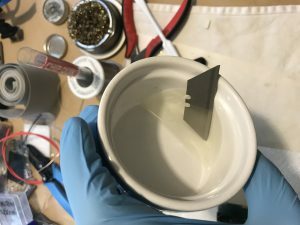 Using a Q-tip and Isopropyl clean up the flux. 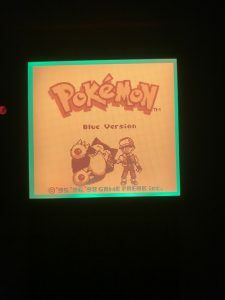 Wire up your backlight and place it behind the screen. 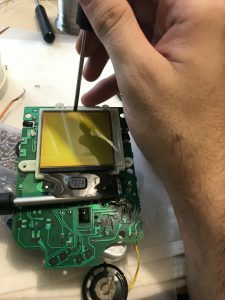 We want to place the backlight in before soldering the vertical ribbon cable, because the backlight is a bit thicker than the space beneath the screen, if you solder up the vertical cable without the backlight in it’ll add tension/stress to the pins on the vertical ribbon cable, which will cause problems down the road. 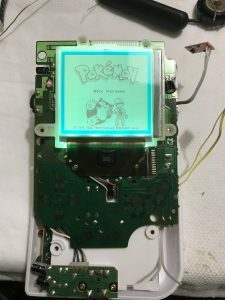 Close the screen and repeat the same process for the vertical ribbon cable. 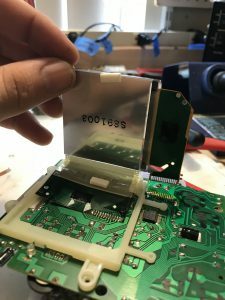 You can now wire up the backlight to either a backlight controller, to C2, directly to the DC-DC board, but best practice would be to install an auxiliary 5v Buck/Boost regulator and power all mods off of the aux 5v rail. Button everything back up, which if you’ve made it this far should be easy and quick! I hope this article helps step your Backlighting game up! 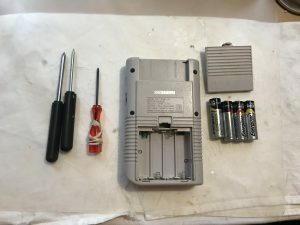 Nintendo Game Boy DMG-01 Gray Handheld System with Castlevania game. Working.